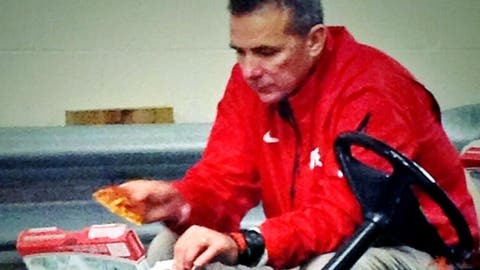 Urban Meyer and the Ohio State Buckeyes had it all laid out for them. After 24 straight wins and a couple of key breaks, all they needed to do was beat Michigan State in the Big 10 title game and they were a lock to play for the national championship. Yeah, it didn’t quite work out that way. The Buckeyes had no answers late on offense or defense and the Spartans ran away with the title — and a Rose Bowl berth — after a 34-24 victory on Saturday night. As for Meyer? He did what so many of us do — he ate away his problems out of the public eye. In this case, under the Lucas Oil Stadium while his family looked on.